Here I am at my most scenic glory using freezer paper stencils to paint the circles on the back of Yikes Stripes! I decided less is more and opted to end off adding more elements to the back. All of the painting here is done with either freezer paper stencils or a stamp made from craft foam mounted on a piece of lathe. The paints were interference and metallic acrylic paints. Tomorrow I'll pin the three layers together in preparation for quilting. Still don't know how I'll quilt it. Perhaps I'll start out by sewing from underside first using the outline of the circles to freemotion the shapes and fill in from there. Well I had threatened to cheat when I pieced the top. I was afraid that trying to get all those cornerstones to line up nicely would be really hard. As it turned out it pieced exceptionally well. My fallback plan had been to use solid black for the horizontal pieces and then fuse the corners in place. Well I didn't need to. Whew! I still have no idea how I am going to quilt this puppy. This afternoon I'll work on the back. So far I"m thinking I'll use a solid black homespun (same fabric I used for the sashing) then I'll paint it using various fiber paints. 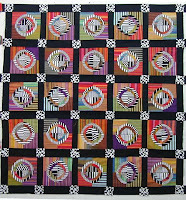 I chose homespun because it matched the texture of many of the striped fabics. 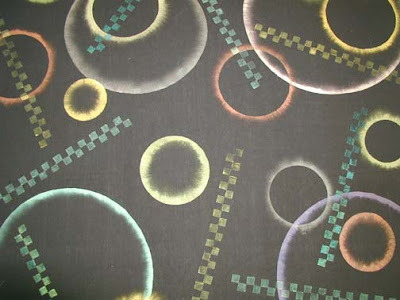 I'll incorporate circles of all sizes- both positive and negative ( done with freezer paper stencils). I'll also use some checkerboard stamps and maybe a few stripes. I'll use opaque and metallic paints so the colors will show up well. Here's a closeup of the top. One cold rainy day a couple of weeks ago I went out with my dad to a local state park in search of trees to photograph in order to create a quilt. 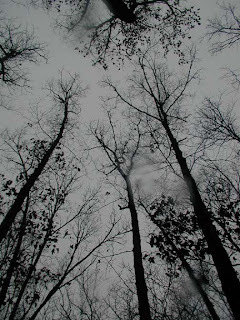 I was fascinated with the perspective of looking up at tall trees from the ground. You only occasionally see this perspective in photographs or art. Perhaps the "artworld" shuns this view. But to me it captivates me and changes my dimensions. As you can see from the blurry spots it was actually raining at the time and about 40 degrees F. Brrr. 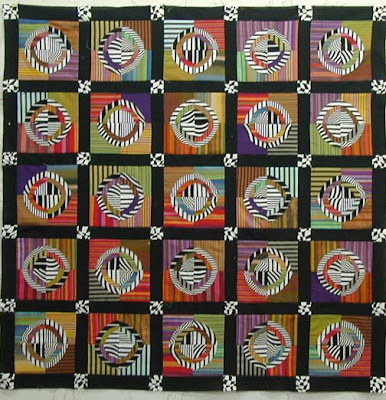 Here's my quilt created from that photo. Except for the metallics it is all hand-dyed silks. I used my usual method of creating the bulls-eye blocks: robbing peter to pay paul. If you want detailed info- just ask. 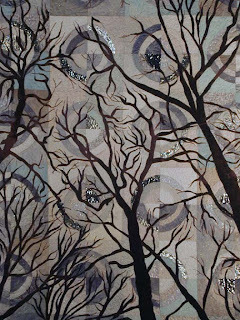 To make the trees, I dyed a large piece of silk in the dark brown. It wasn't dark enough for my use so I painted a thin wash of charcoal over the top with a wide brush. Then I applied fusible web to the back side and peeled off the paper. To get the detail of the trees I printed the photo with my inkjet printer onto plain white paper. Then I traced the key branches onto acetate. I blew it up with an overhead projector and inked in the elements onto tracing paper. Then I laid out the quilt top, layered it with the brown fabric then the tracing paper and pinned it all down. Then stitching through the paper I freemotion outlined all the trunks and branches. Then I tore off the paper and cut away all that wasn't tree- kinda like Leonardo DeVinci when he said that to make his masterpiece sculptures he just kept chiseling away anything that wasn't the sculpture within.... so much for comparing myself to ole Leonardo! Hah! After all the extraneous fabric was cut away I then activated the fusing by ironing the brown fabric down. 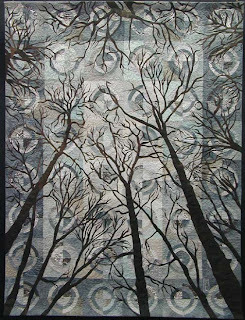 Then I layered the quilt top, cotton batting, and the back (Yes I painted the heck out of it and when the piece comes back from Milwaukee I'll try to remember to photograph the back) Then I again outlined all the trees and branches with freemotion stitching using a varigated rayon thread. 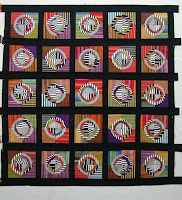 For the background quilting I used metallics threads- the center panel thread is a holographic white, the middle panel is hologrphic silver and the outer panel is a holographic charcoal. All in all I am very pleased with the results. The title is "Listening for the Silence." It is inspired by the quiet that comes in extreme cold or waiting for the snow. Since my parents have moved in I find I miss those utterly quiet moments that come with being completely alone. Here's a detail shot. I think you can see the metallics better in this shot. BTW if you click on a photo you'll get a larger version to view. I finished this last Thursday. 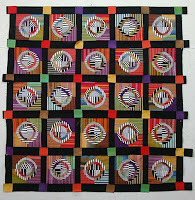 I plan to finish piecing "Yikes Stripes! " this weekend and I get to finsh signing the 1,000+ posters for the Missouri Art Commission Arts Awards. Perhaps since I have been pacing myself, I haven't had as sore a wrist as I expected from having to autograph that many posters. Ah-- the lessons learned along the road to fame and fortune. This time of year is fraught with periods of uncertainty coupled with periods of supreme exhilaration. Before you think I've gone bi-polar, let me explain. This is the time of year when I have to send out applications for upcoming shows. There is always a certain anxiety of wondering if I'll get into the shows of my choice. Even though I have created work of the caliber I believe should allow me to join the ranks of the "chosen," that choice is not up to me. I create the work, photograph it to the best of my ability and let it go. For weeks I await a decision. During this same period I am at my most intense period of creativity. I am between show seasons and this is when I can focus on new work. I consider this a period of conversations with the universe. I am almost always surprised at what gets created during this period. I enter the period with a vague idea of what I'd like to address. More like an opening conversation. Since I no longer feel I am alone when I am creating (the universe usually has something to say), I am often quite tickled to see where the universe and I wind up. At this point I have no idea of how I'll do the back of "Yikes Stripes" nor how I'll quilt it. That'll be the adventure that awaits. Here's the project I've been working on for the last 2 days. 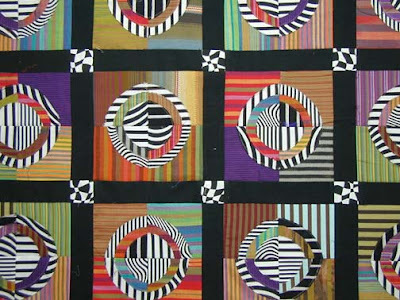 In general I've begun working on a series of quilts for my exhibition at the MADI Museum Dallas in April. I'm at the point where I have assembled the individual blocks but am trying to decide how the blocks will be joined. Here's a photo showing the blocks up against each other with nothing to separate them visually. 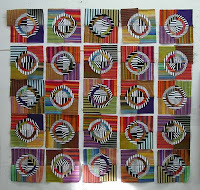 To me the stripes have so much energy that I need to separate them and give the eye a place to rest between blocks. So in this photo you can see I've separated them with a black sashing. On this one I played with a zany checkerboard as the centerpoint. This is the choice I finally went with. It is strange that the day I finally decide to start my blog is the same day I found out that my friend Jan Boyer died several months ago. 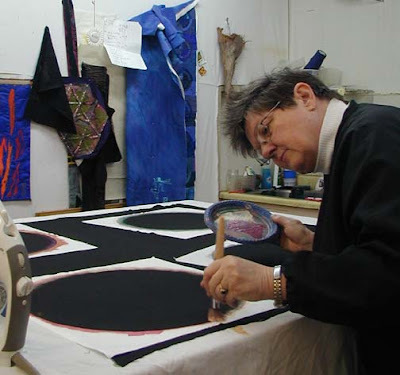 Jan was instrumental in introducing me to the world of dyeing and surface design. I was the fortunate recipient of her dyes when she decided that she had become super sensitive to mx dyes. As it turned out- her challenge turned out to be long undiagnosed Lyme's Disease. What a tragic loss to the world. I am generally a believer in "you get what you earn." In Jan's case I think that rule can't be right. Perhaps this is the first instance for myself of seeing that maybe life often just isn't fair. I hope to see more "life is fair" to compensate for this loss. Jan- you are truly missed.